PHIVIDEC administrator Franklin Quijano laughed off Misamis Oriental 2nd District Rep. Juliette Uy’s call for his suspension, pointing out that only President Duterte and not the legislative department can do that. Quijano said this in response to Uy’s proposal that the House committees officially seek Quijano’s suspension in connection with the controversial shipment of garbage from South Korea to Misamis Oriental last year. Uy sought Quijano’s suspension as she blamed Phividec for allowing VNS Verde Soko Philippines Industrial Corp. to bring in thousands of tons of garbage from South Korea via the Philippine Sinter Corp. port in Villanueva and the Mindanao International Contrainer Port in Tagoloan. Verde Soko has a “recycling plant” in Sitio Bugwak, Barangay St. Cruz in Tagoloan. The property is within the Phividec estate. Quijano however said Uy’s proposal, even if approved by the House committees that conducted a joint public hearing here last week, would have no effect on him. “Akong paaboton kon unsay himo-on sa Presidente kay para sa ako, Presidente man ang nagtudlo nako diha, unya mag-agad man ko sa Presidente kon unsay iyang gusto,” Quijano said. The former mayor of Iligan City also denied that he gave Verde Soko permission to offload garbage from MV Affluent Ocean at the PSC port in Villanueva on July 21, 2018. Quijano said this in reaction to a claim made by Reymart Santos, PSC resident manager, that the reason why the tons of garbage was offloaded in the port and then moved to the Phividec estate in Tagoloan. Santos said the berthing documents were signed by Phividec people. Quijano said it was the Bureau of Customs and Bureau of Quarantine that gave the go-ahead and not the Phividec. “Ang mao sa Phividec, igo lang sa pagpirma sa berthing documents, kay kanang berthing documents, ma-o nay among basihan sa among berthing fee nga bayran sa tag-iya sa barko. Pero dili kami ang nagpagawas sa maong mga kargamento kon dili sila sa Customs ug Quarantine,” he said. He said the Bagong Buhay Arrastre Services Inc. (BBASI) provided its services because the customs and quarantine bureau gave the green light. “Pag-ingon sa Customs ug Quarantine sa BBASI nga wala nay problima, ikaw kaha ang BBASI, dili kaha nimo i-diskarga?” Quijano asked rhetorically. 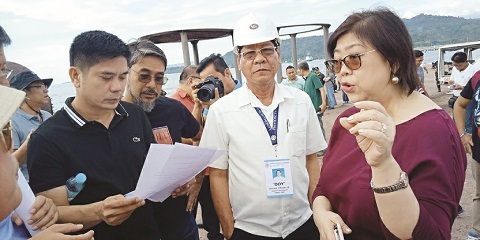 Meanwhile, Reps. Uy, Frederick Siao of Iligan City, and Malou Acosta-Alba of Bukidnon’s 1st District sought the suspension of Customs Collector Floro Calixihan as they held him as among those liable for the controversial shipments from South Korea. The House Committee recommended the suspension of Customs Collector Floro Calixihan on Friday’s public hearing and consultative investigation held in the city. The legislators said Calixihan has admitted that Verde Soko’s importation documents had his signature, and that he signed the papers three days before the tons of garbage arrived via the PSC port. Siao said Calixihan acted like an employee of Verde Soko. He said it looked like the misdeclaration of importation was planned and coordinated, and Calixihan appeared to be part of it. “Suspending Calixihan is necessary to preserve documents and contain any likely damage they have done,” he said. Siao said the Customs official should be held responsible for the non-collection of import duties as a result of allowing the garbage shipments to be transferred out of the port without payment of the taxes and duties. “Calixihan may have violated a host of customs and environment laws by his own actions,” he said. Meanwhile, the joint House committees issued a show-cause order against Verde Soko executives after they failed to attend during the public hearing here on Friday. The order was made on the motion of Agusan del Norte Rep. Lawrence Fortun who said that Verde Soko executives should explain why they should not be punished for snubbing the hearing.